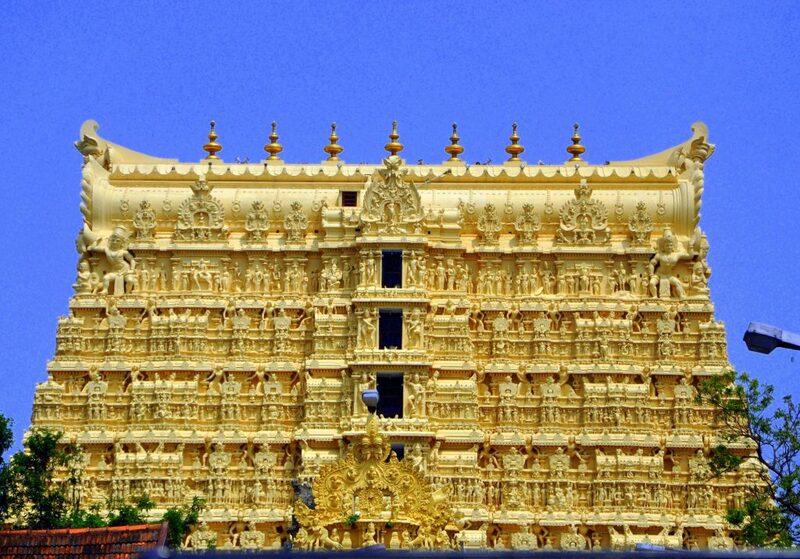 The richest temple in the world, the Sri Padmanabha swamy temple located in Trivandrum in Kerala is a temple filled with mysteries and wonders. In recent years this temple has been the talk in news owing to the vast treasures that were found inside six vaults in the temple sanctum. A treasure trove of diamonds, emeralds, pearls and other precious metals were found in those vaults. Another room, which is the seventh among these is forbidden from opening. Some believe that this door is guarded by serpents and is impossible for any human or machinery to open it. Other stories go that opening the door will open the gateway to the sea of milk which would engulf the planet and mean the end of Earth. Besides all these stories and beliefs, the temple is a magnificent one astonishing everyone with its spectacular architecture and the stunning beauty of the presiding deity Lord Padmanabha Swamy who is in the reclining posture. He can be worshipped only through the horizontal arrangement of three doors owing to the size of the statue. A temple which is 15 lakh years old, the Pundarikaksha temple near Tiruchirapalli is one among the 108 Divya Desams of Lord Vishnu. 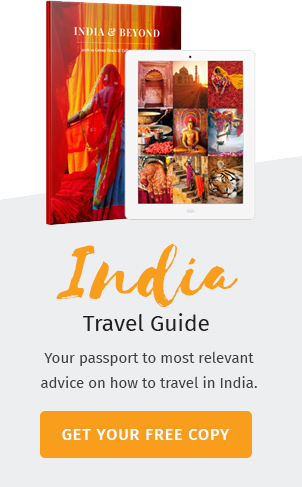 Inscriptions in the temple denote that the temple was built 1500 years ago by the Pallavas. The temple which is built in the Dravidian style of architecture is older than the Sri Ranganathar Swamy temple in Trichy. It was built at this place by King Sibi as he encountered a white boar which is said to have been one of the incarnations of Lord Vishnu himself. A n interesting ritual in this temple is that the consort of the Lord is given first rights during all poojas and processions and the Lord follows her. Around the outer wall of the temple, there is a pond built with steps arranged in a zig-zag pattern which is still an engineering mystery. 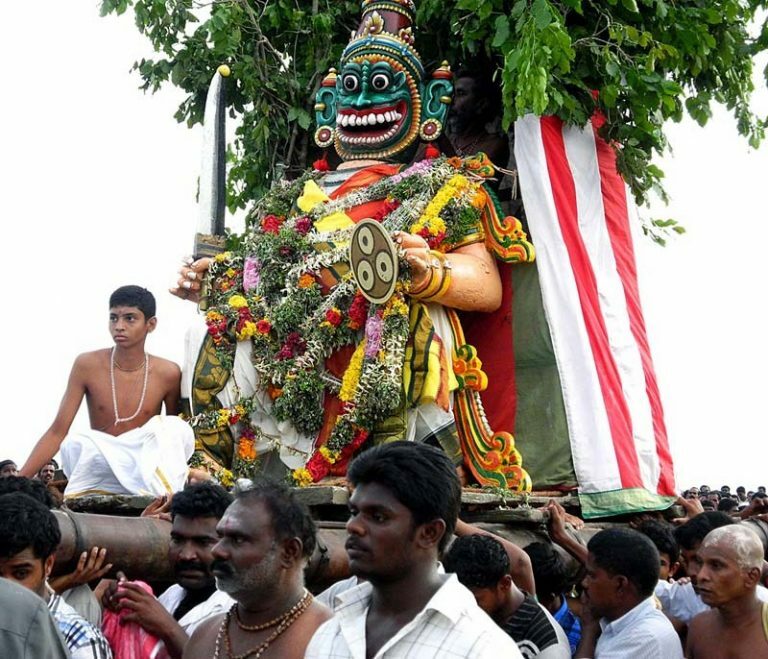 During festivities the temple’s chariot is taken out in a procession of the small village in much grandeur. 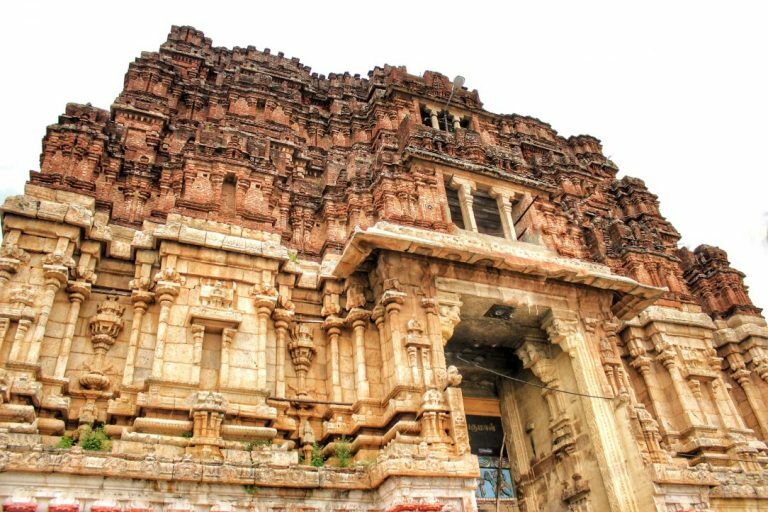 The mighty Brahmapureeswarar temple which is a 2000 year old ancient temple is situated in the outskirts of the city of Tiruchirapalli in the serene village of Tirupattur. This temple is an ode to the Chola style of architecture which resembles their intricate sculpting works. The temple is built in such a way that the first rays of the sunlight on the auspicious days of Panguni month falls on the main deity. Here Lord Brahma is seen worshipping Lord Shiva and Mother Parvathi. It is believed that people who visit this temple and pray to the Lord are given a new turn in life since Lord Brahma, the Creator himself got his fate rewritten at this place. Besides, there is a meditation hall in this temple where the tomb of Saint Pathanjali, who introduced the Yogic science to the world. Aside the sub shrine of the Goddess, there is a series of smaller subshrines where all the twelve Jyotirlinga are housed which you can never see in any of the other Shiva temples. 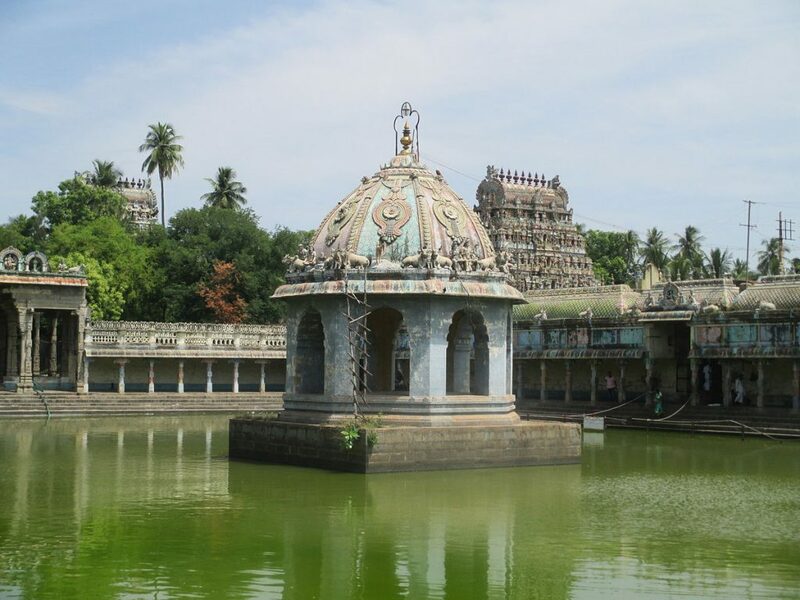 Built in the 13th century, the Thillai Kali Amman temple is situated in Chidambaram. The main deity is an angry Goddess Kali who is seen sitting faced East. It is believed that it was at this place that Lord Shiva defeated Goddess Parvathi in a dance popularly mentioned in the Hindu legends as “Rudhra Thandavam” meaning a furious dance performance by Lord Shiva. The goddess is also known as Ellai Kali Amman as the temple is situated in the border of Thillai protecting the region from the evil. This ancient temple is over 800 years old and was built by the Chola king, Kopperunjingam. The Goddess graces devotees with four heads representing the four Vedas. 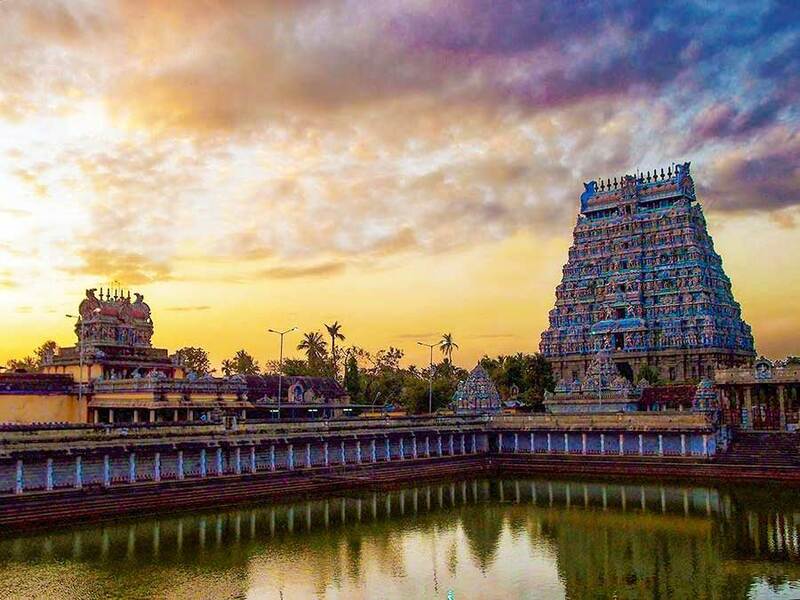 Known popularly all over for its Naadi astrology, the Vaitheeswaran temple is situated near Chidambaram in the village of Sirkazhi and is dedicated to the worship of Lord Shiva. 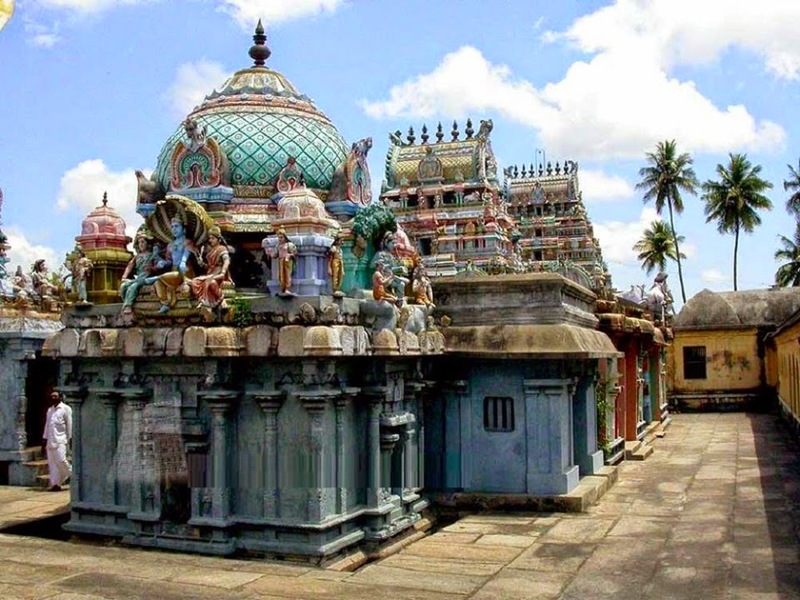 This temple is one among the nine Navagraha temples and the Vaitheeswaran temple is associated to Mars. This quaint village is famous for its Naadi astrology where predictions are made by reading palm leaves that were written by the sage Agathiyar. With the impression of your thumb, the experts there take out few palm leaves which reads your past, present and future. It is believed that the Lord Vaitheeswaran can cure any disease with the small pot in his hand filled with the medicinal oil and he is known as the “God of Healing”. 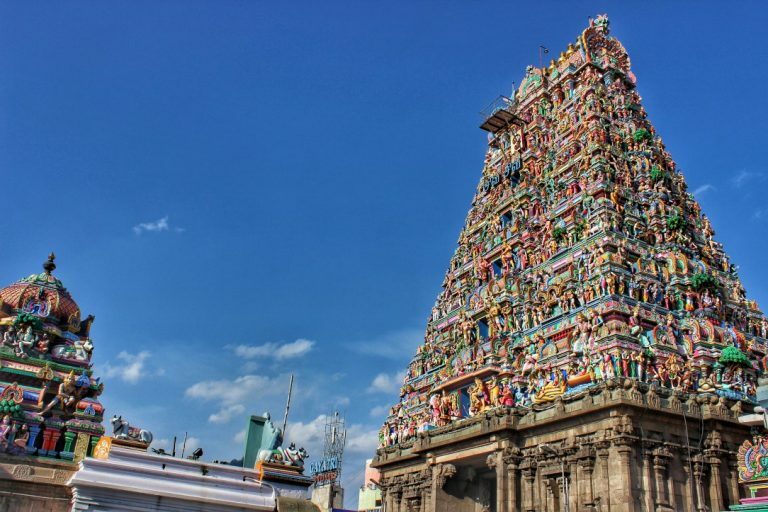 According to many folklore, the Kapaleeshwarar temple was located close to the sea at Chennai, the present day capital city of the South Indian state Tamil Nadu . This was destroyed by the invaders and the present temple was built by the Vijayanagara kings during the 16th century. The temple was built in the Dravidian style of architecture and is a fine example of the Dravidian architectural works. Legend has it that Goddess Parvathi in the form of a peacock worshipped Lord Shiva in this place. Hence, the area came to be called as “Mylapore” as “Mayil” in Tamil means peacock. Annually the temple hosts its famous Theppam festival where the water tank in the middle of the temple is filled with beautiful lights during the evening which illuminates the water. The Arubathimoovar festival is yet another grand event when all the 63 saints of Saivism are taken in procession in the four streets around the temple in Mylapore and the event is attended by lakhs of devotees. 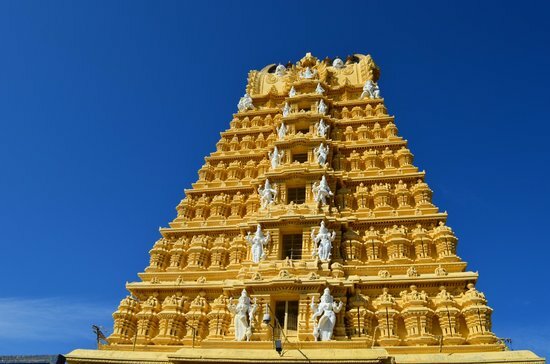 One of the most magnificent temples in India, the Chamundeshwari temple is a popular pilgrim center in Mysore , the most popular tourist destination in the South Indian state Karnataka. The temple atop the hill Is considered to be the most powerful shrine of the Goddess which was built by the during the Hoysala reign. The main deity, Goddess Chamundeshwari is seen seated on a lion with her trident piercing the demon Mahishasura symbolizing the victory of the good over the evil. The temple is fitted with a majestic tower that seems to concave into the sky. This 1000 year old ancient temple is built in the Dravidian style with exquisite architectural works. The seven-tier Gopura at the entrance is seen to have seven golden Kalashas. Goddess Chamundeshwari is brought in a procession on a caparisoned elephants during Dussehra which is a pomp event attended by lakhs of devotees and tourists from all corners of the country. Tales that were heard of as kids from grandmas and old wives can actually be seen in the Brahmarishi hills. It is a popular statement that God created Earth and hence, you can feel his presence in everything. Siddhas are known to show the way to Godly living. Hence, it is an interesting fact to know where they live and their lifestyle. In the hills of Brahmarishi, 210 siddhas live in caves enclosed in thick jungle canopies. It is a very tedious task to approach them as they live away from any human contact. If you wish to have spiritual enlightening you are welcome to approach the siddhas and share in their mysticism and blissful life in the hills. 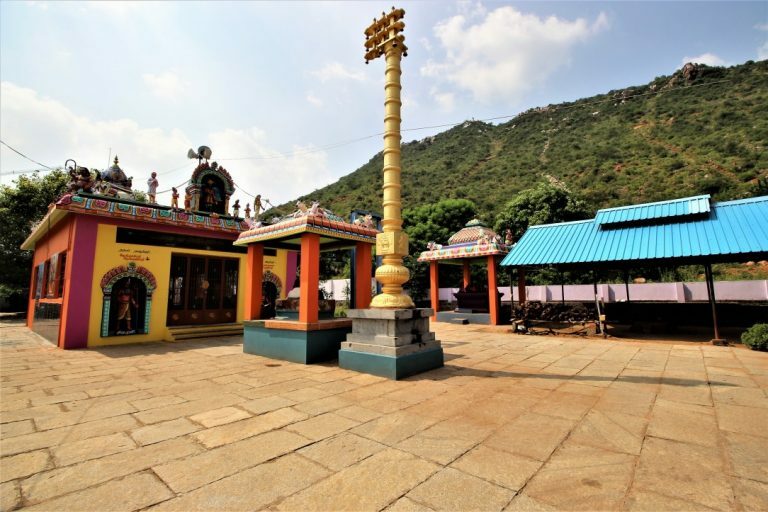 The famous temple of Sri Thirumangali Amman is situated in this hill which is an ancient temple built 500 years ago by Tamil kings. The actual location of Brammarishi hills is in a small town called Perambalur near Trichy in the South Indian state Tamil Nadu. History remembers the Golden era of southern India as the rule of the king Raja Raja Cholan. 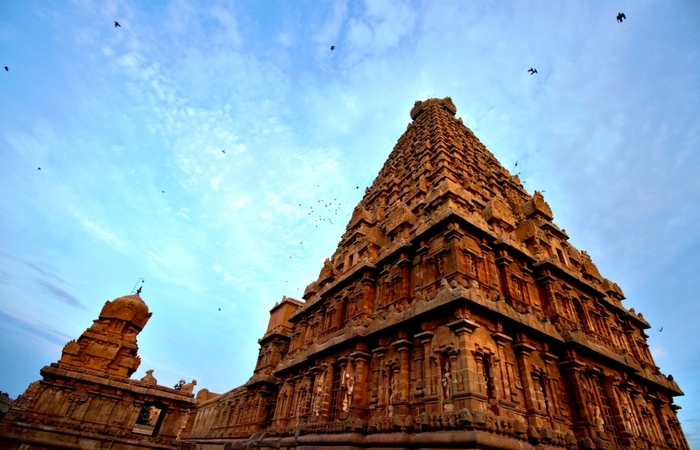 Built during his reign and engineered by the king himself, is the magnificent Brihadeeswarar temple which was completed in 1010 AD in a small town called Thanjavur in the South Indian state Tamil Nadu. The devotees of the temple are welcomed by a huge Nandi which was sculpted out of a single stone. The huge Linga idol inside the sanctum astonishes the devotees with its magnificent presence. 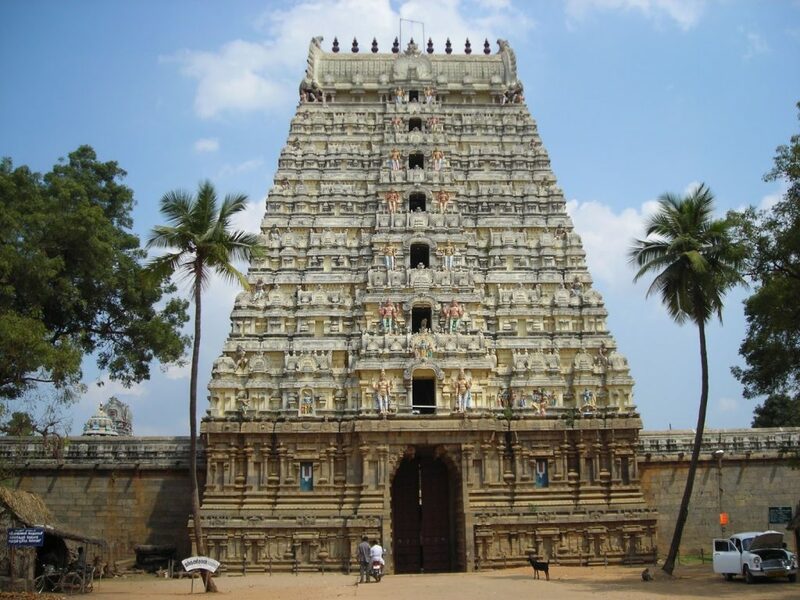 This temple is one among “The great living Chola temples” listed in the UNESCO World Heritage Monuments. The main temple is built entirely out of granite. What astonishes historians the most is that there was not a single quarry for granite in a 100 mile radius of the temple. Hence, the granites had to be transported from a distant place. Yet another mesmerizing wonder in this temple is the single stone weighing about 80 tons is kept atop the tower. Altogether, a visit to the Big temple will give an insight into the Dravidian Architecture flourished with the ancient heritage and culture of the Chola Kingdom. The six day ravaging war between Lord Muruga and the demon Surapadman marks the festival of Skanda Sashti. This is celebrated all over Tamil Nadu to mark the victory of Good over Evil. You can see many devotees thronging the streets on their way to a temple to celebrate the festival. Most of them go to great lengths of piercing the two sides of their cheeks, tongues and in some cases even lips with a needle which is shaped in the form of a Vel, the weapon which was used by Lord Muruga to kill Surapadman. People dress up in holy colors like a mild yellow and carry Kavadi, a bedecked wooden cradle on the shoulders, to the temples. They believe that doing so is a great offering to Lord Muruga to seek his blessings. The six holy abodes of Lord Muruga deserve a special mention here where the Soora Samharam is celebrated in a very grand manner attended by lakhs of devotees. 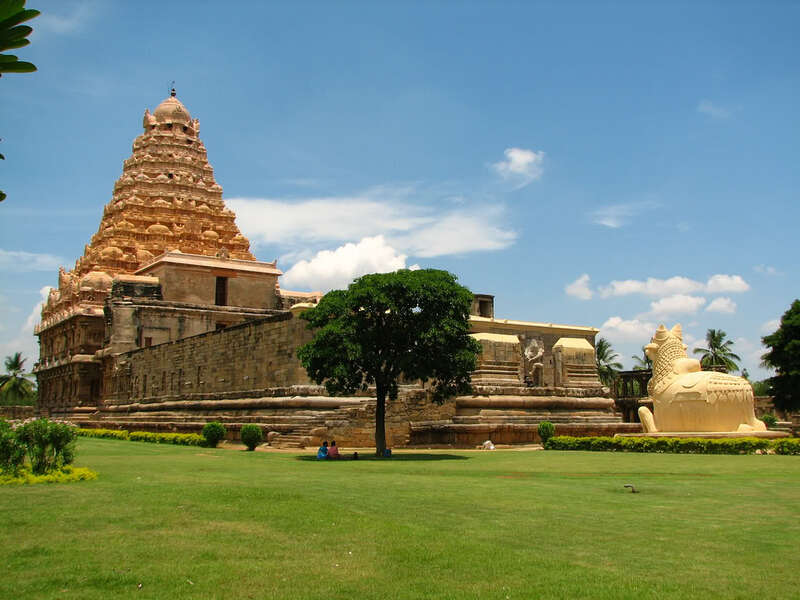 The tedious name of the town of Gangaikondacholapuram means “The land that took over the Ganges”. This town was constructed near Kumbakonam to mark the victory of King Rajendra Chola over the Pala kingdom. This town has a replica of the Brihadeeswara temple in the center and is recognized as “The great living Chola temple” by UNESCO. It became the capital of the Chola Empire during the reign of Rajendra Chola, the son of the great Raja Raja Chola I and continued to be so for the next 250 years of the Chola rule. Rajendra Chola assumed the title, Gangaikonda Cholan after the completion of this capital and continued to rule proving to become the greatest among the Chola Dynasty. The highlights of this temple is the size of the Linga idol in the sanctum and the statue of lion. Once you step into the mouth of the lion, you are led by the steps taking you a to a pond which was once used by the royal women. Thus, the temple has so many architectural wonders which are to be seen to be believed.